When I found out I was going to be a part of Book of Yum’s Gluten-free Vegetarian Thanksgiving Event – I was so excited. This is the first time I have had the pleasure of participating in something like this, but I have wanted to ever since I started my blog a year and a half ago. This one felt like the perfect place for me. Although I am not exactly a traditional vegetarian, I consider myself to be a “conscientious omnivore”, meaning I only eat meat that I feel good about eating that comes from a local farmer where it is raised humanely, free to roam, eat pasture and not be filled with hormones or antibiotics. We get all of our meat from Sojourner Farms in Olean, NY. This is the ONLY meat we ever have in our home and I feel like it is the right choice for us. We probably only eat meat anywhere from once a week to once a month at home, depending on what we have on hand and what we feel like. The rest of the time we eat completely vegetarian. I really love cooking vegetarian and find that eating a mostly vegetarian diet plus eating a small amount of local pasture-raised meat to have really changed my health immensely. I also feel like for me, it is a wonderful way for me to take a stand against the factory farming industry. Sea, from Book of Yum, really wanted this event to not only make the transition into the first holiday season for newly diagnosed gluten-free folks to not seem so daunting, but to also highlight all of the wonderful options for those who are, or are cooking for those who are gluten-free and/or vegetarian (or vegan). Many of us find ourselves bringing our own food since many times the hosts are so terrified and paralyzed by what to cook, plus it alleviates the stress we have on wondering what we are even going to eat when we show up at someone else’s house. 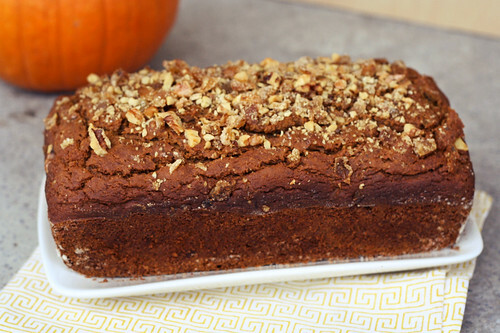 I love all of the wonderful recipes that have been featured so far, it’s such a great collection of classic dishes and new unique Thanksgiving options. This year, like last, hubby and I are making the healthy and gluten-free Thanksgiving meal that we want and eating early in the day. After I get up and go to an early morning yoga class, while hubby takes our dog, Seri, to the park, we’ll spend the day cooking together, watching the parade and football and a enjoying a relaxing day at together at home without any work. After we are done eating, we will head over to my parent’s where they are having nearly 30 people for dinner (!) and we’ll join them for dessert, a cocktail or two and it will be the perfect way to have it all. We took a nice long drive out to the country yesterday to pick up our Thanksgiving turkey from our farmer, Pierre, at Sojourner Farm in Olean. Since we will be having a turkey for our Thanksgiving dinner, I wanted to plan the rest of the meal without any meat. 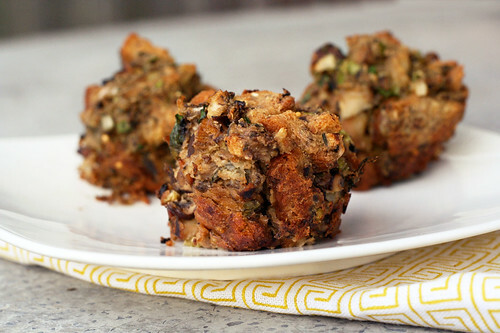 I was really excited to take on the challenge of making a meat free stuffing this year. So making it ahead of time for Book of Yum’s event was even more exciting since it was a test run of this recipe, for me. In the past I have sought out some type of healthy sausage to make my mom’s famous stuffing recipe that I had to have, but it always feels so redundant and unnecessary to have a side dish with meat in it, alongside the turkey. I really don’t need or want that much meat in one meal. I decided on making mushrooms the stars of the stuffing this year. This delicious side dish is so full of rustic and earthy flavor, the mushrooms have a nice chewiness to them and the beautiful fresh thyme pulled it all together so nicely. Additionally, as you can see by the above photos, I also decided to experiment with making little individual stuffing “muffins”, if you will. I dreamt this up as a way to make sure that everyone gets lots of the crispy goodness that makes stuffing so darn delicious. Come on, admit it, you’ve gotten into with a family member on Thanksgiving over who get’s the edges. In our house, my hubby usually gets the crispy edges on anything that has them, by default. If you don’t care about the crispies (as my husband calls it) or don’t want to mess with a muffin tin, this will perfectly fit into a 9″ x 13″ baking pan. I ended up having a little bit leftover after filling the 12 muffin cups, that I put into a very small glass casserole dish. I didn’t want to call this recipe “Stuffing Muffins”, as I feared it would turn people off, since it does sound pretty disgusting, really. 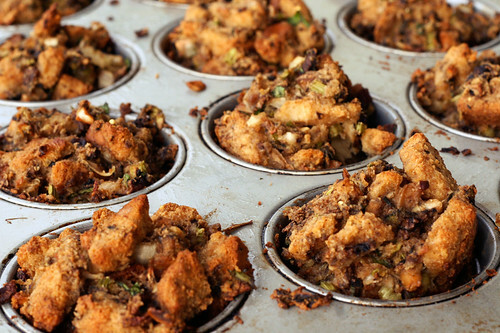 Even if you don’t try the stuffing “muffin” approach for this Thanksgiving, you have to try it soon, it is so worth it and I honestly cannot believe I didn’t think of it sooner. This stuffing does have two eggs in it, so if you are vegan you could experiment with an egg replacer such as Ener-G or making your own flax-seed egg replacer (To replace one egg: 1 tablespoon ground flaxseeds plus 3 tablespoons hot water. Stir together until thick and gelatinous.) I have never made my stuffing vegan, but I am sure it would work perfectly. Please let me know if you try it out. Additionally, you will obviously have to make sure the bread you use is vegan. 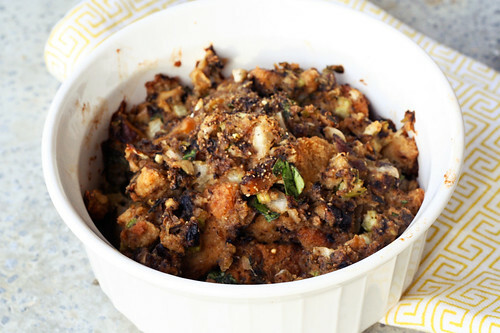 Besides being very excited about how this recipe turned out, I am also very excited that I get to have stuffing twice in a week’s time, that isn’t a bad deal at all. Stuffing is one of my favorite things about Thanksgiving dinner, I don’t think I have it any other time during the year, so it always feels so special. Between that and the mashed potatoes, those are two things that will NEVER be missing from my Thanksgiving menu. For my husband, Mark, I always have to make him a single-serving of his Momo’s famous sweet potato casserole, complete with an ungodly amount of butter, brown sugar and yes, it is even topped with marshmallows. It’s not for me, but I can totally appreciate how it won’t be Thanksgiving for Mark without it, so I will always make it for him. What dish will always be a part of your Thanksgiving dinner? Preheat oven to 350ºF. 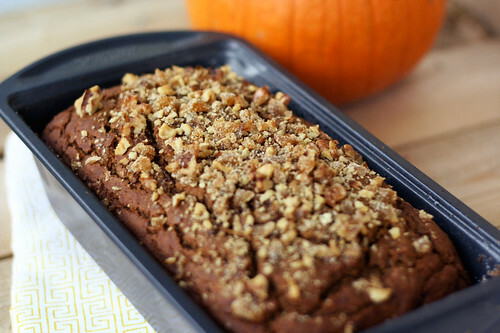 Crumble or tear the dried bread into small pieces and place into a 9″ x 13″ glass baking pan. Wet the bread with enough broth or water so it starts to get soft, but you don’t want it insanely soggy, either. If you add too much liquid, just pour it out. Mix with eggs, mushrooms, onions, celery, herbs, olive oil and salt and pepper. Don’t be afraid to get your hands dirty, roll your sleeves up and just get your hands in there to mix it all up, it’s the only way to do it. Once everything is evenly mixed in you can either leave it in the baking pan and bake it as is or start scooping with your hands, an ice cream scoop or a large spoon into a greased non-stick muffin pan. (I greased mine with a very small amount of vegetable shortening). If it doesn’t all fit into the muffin pan, scoop the remainder into a small glass casserole dish. 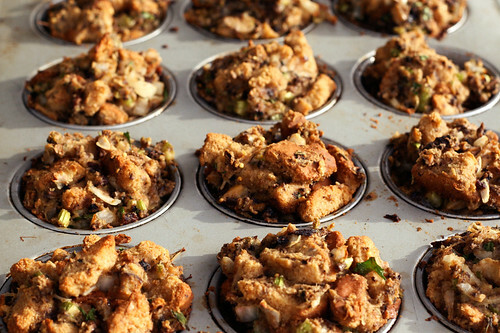 Place the glass pan or the muffin tin into the oven and bake for 45 minutes to an hour until the top(s) are browned and crispy. 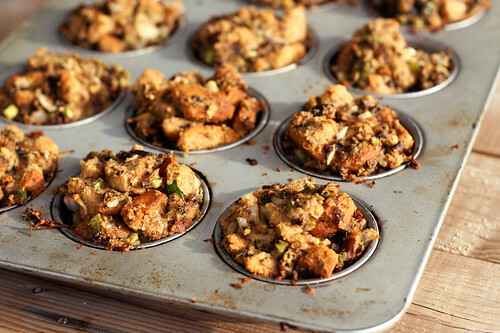 Let the stuffing “muffins” cool slightly before attempting to pop them out of the muffin tin and don’t worry if they don’t come out like a perfect muffin shape, most of mine didn’t, some even fell apart a little. Don’t worry, it’s stuffing, its rustic and it isn’t about the shape and look of them, it is all about the crispies! NOTE: since I didn’t want to dry my bread overnight or for a day or so, I placed the sliced loaf in a single layer on a baking pan in the oven at 200º for about an hour to dry it out. 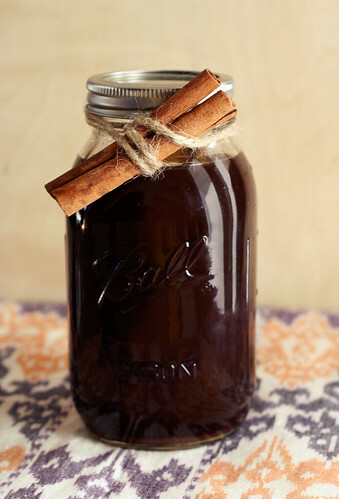 I have seen quite a few recipes floating around on blogs and on Pinterest for homemade chai concentrate. Why hadn’t I thought of this before? It’s so easy and you can customize your own recipe to exactly what you are looking for in your chai. I like mine spicy, with a strong tea flavor and with a subtle sweetness. I find the packaged concentrates from the grocery store to really lack flavor and many times they are just too sweet for me. I looked around at tons of different recipes and ultimately settled on this recipe. I have made it three times now to get it exactly how I wanted it. The first time I added my coconut sugar and honey in at the end, which resulted in a cloudy concentrate. It tasted perfectly delicious but it bothered me that it was cloudy. I made it a second time using date sugar and honey at the start, the sweetness was so nice but the date sugar I had was a bit clumpy, which annoyed me. The final time I used coconut sugar again but added it at the start, this time I skipped the honey. I saw a few recipes without pepper at all and some with just a tad bit of ground pepper. I really love the spiciness from the pepper so I added in whole peppercorns. I also really love the addition of orange zest and nutmeg in my chai. I love that there are no rules when making your own chai concentrate. Use this or any other recipes as a guide, but tweak the recipe and ingredients to your preference. Have fun with it. You can serve your chai warm as a hot latte or cold as an iced latte. Either way, I go with a 1 to 1 mixture on the chai concentrate to a non-dairy milk. I prefer almond milk personally, but you could use regular milk or any other non-dairy milk. If you like it less strong, use less tea bags, or mix 1 part concentrate to 3 parts milk instead of 1 or 2. Play around. If you are like me, after you make this once and take the first sip, you will be sure to always have a batch in the fridge. PS – I am loving the comments about using the concentrate in other things like baked goods or making a syrup from it. SO brilliant, I didn’t even think of that. Great ideas! 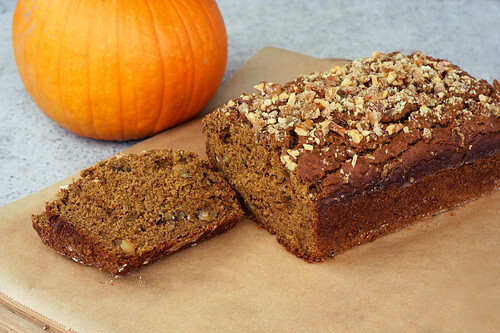 adapted to suit my personal taste from many different recipes – this one and this one mostly. Prepare the teabags by removing any tags if there are any and tying them all together. 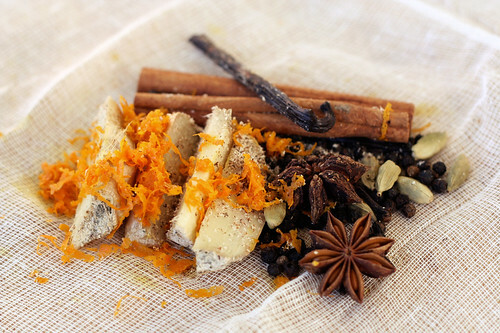 Prepare the spices, vanilla bean and orange zest by laying them in your cheesecloth, I leave my cinnamon sticks out to make the little pouch of spices a bit more compact. Tie the cheesecloth pouch shut with a small piece of kitchen twine. If you leave the cinnamon sticks out, just tie them together with kitchen twine. *If you don’t wish to use cheesecloth, you will just add all of your spices directly to the pan when the time comes and strain them out after. Add the water and sugar to a medium sized saucepan and bring to a boil over a medium-high heat. Once boiling, reduce the heat to a simmer and put in the tea bags, cheesecloth pouch and cinnamon sticks. Simmer for 20 minutes. Remove the pan from the heat strain the concentrate through a sieve or just remove the tea bags, cheesecloth pouch and cinnamon sticks. 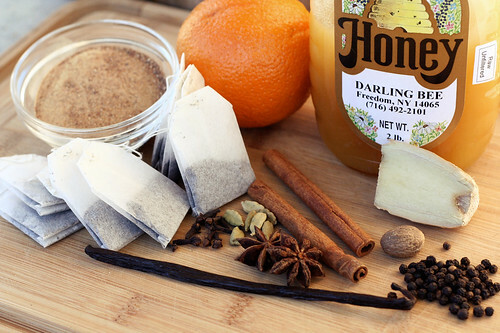 At this point if you want a bit more sweetness you can add a tablespoon of honey, stir to dissolve. I don’t always do this, but it is a really nice touch. Additionally, if you didn’t use a whole vanilla bean, add your vanilla extract now. Stir to combine. Allow the mixture to cool before pouring it into an airtight jar or container. This amount fits perfectly into a 1-quart mason jar. Store in the refrigerator for up to one week. ** To serve, mix 1 part concentrate with 1 part milk of your choice. 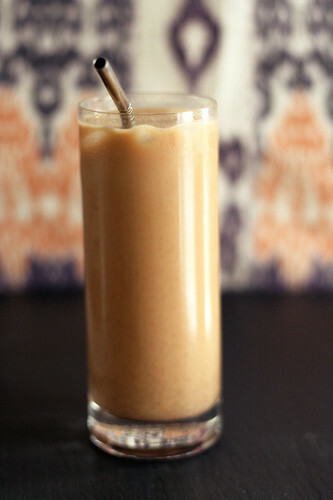 I personally love unsweeteened almond milk (you can even make your own). Heat for a warm beverage or serve over ice for a cold drink. I got an email a few weeks ago from Farmers & Artisans, an amazing local shop that features produce, dairy and meat from local farms. They were offering 4 and 8 quart baskets of Concord grapes from Blackman Homestead Farm in Lockport. I decided with how much I am in love with my juicer right now, I need to buy the 8 quart basket, so I could experiment with making juice and trying to make jam for the first time. I never buy jam at the store because I hate all the preservatives, but occasionally I will buy a jar from the farmers market. I was a little concerned about the jam making since I had never done it before and I really didn’t have a great way to remove the seeds as I don’t have a food mill. I made jam twice, trying out two different methods to see which would work best. The first way, I added the grapes whole to the food processor, with the sugar and pulsed them a few times to break them down and mash em up. Then I cooked the jam down, allowing it to thicken. Once it seemed like it had cooked down enough and was quite thick, I ran it through a strainer to remove the seeds. The only problem with this method is that not only did it remove the seeds, but it also removed the thick hunks of gooey goodness (the natural pectin) that makes jam what it is. 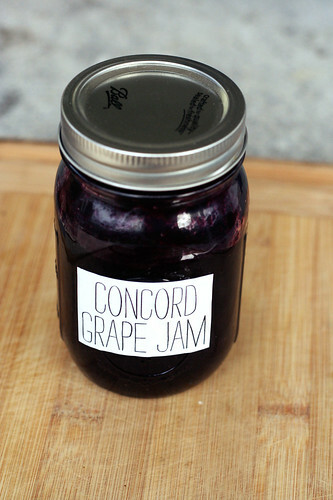 I ended up with more of a Concord Grape sauce or thinner jelly. I tried adding it back to the saucepan to allow it to thicken more, but it just didn’t do it. The jam needed bits of the skins and more of the natural pectin. All was not lost, I have been spooning the first batch of jam over granola and oatmeal, it would also be great drizzled over ice cream or yogurt or in a smoothie. So, the second time around I decided to separate the skins from the flesh or pulp (and therefore the seeds) of the grapes, one by one. It sounds kinda tedious, and I guess it kinda was, but I didn’t mind, I knew it would be worth it. Then I pulsed the skins with the sugar in the food processor and cooked that down on its own, cooking the pulp down in a second saucepan by itself, mashing every so often to break it down. Once the skins had cooked down quite a bit and really gotten thick and jam-like, I strained the pulp from the other saucepan through the strainer to get as much of the juice and added it to the beautiful skin mixture. It was surprising how easy the whole process was. 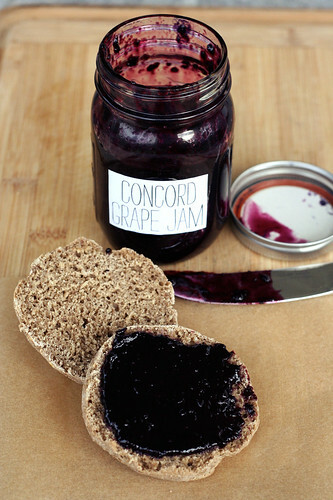 From what I have read Concord grapes are a slip-skin variety grape so I suppose that is what made that part of the process so much easier than I had anticipated. 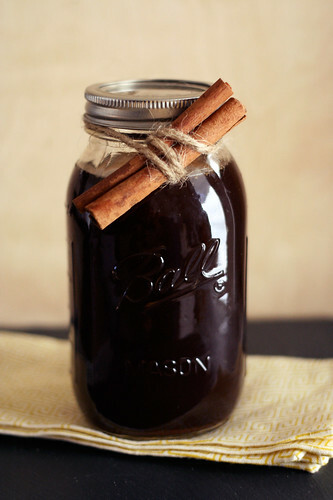 You could certainly make a larger batch and go through the hassle of canning and preserving if you wish. I am not versed at all in preserving and honestly am quite intimidated by the whole process. Maybe some day when I have a huge kitchen and tons of storage space I will experiment with it. 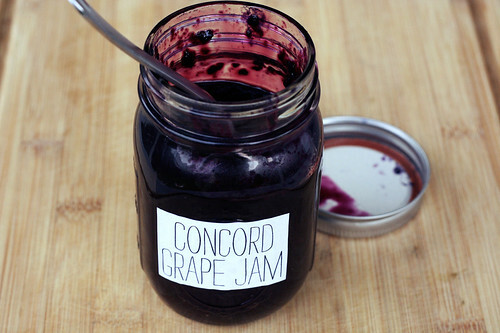 This jam is preservative free and is full of intense grape flavor. It is perfectly sweet and tart. I am sure you could experiment with using honey as a sweetener instead of sugar, I just wanted to go the traditional route for my first time. If I get around to experimenting with honey, I will report back. Obviously if you have a food mill you can simply process the grapes whole with the sugar, then use your mill to remove the seeds and cook down the mixture in one pan, no need to strain. I decided to fully enjoy this jam I needed to make some delicious gluten-free multi-grain rolls. I couldn’t just slop it on any ol’ store-bought bread or roll, it seemed sacrilegious. I used gluten-free girl’s recipe with a few subtle substitutions. I used tapioca starch instead of potato flour and I made my own oat flour since I couldn’t find any that was certified gluten-free. I highly recommend this recipe. 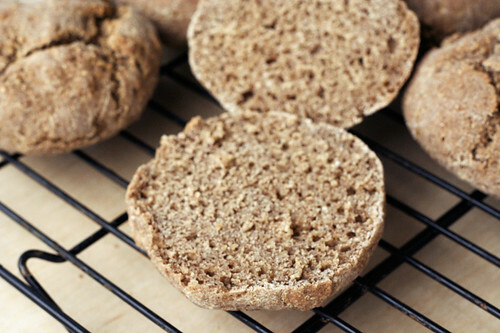 These rolls are incredible and I love that the recipe is gum free (no xanthan or guar gum). They are super crusty on the outside and soft and chewy on the inside. These rolls are perfect as is with a little jam, toasted with a veggie burger, etc. 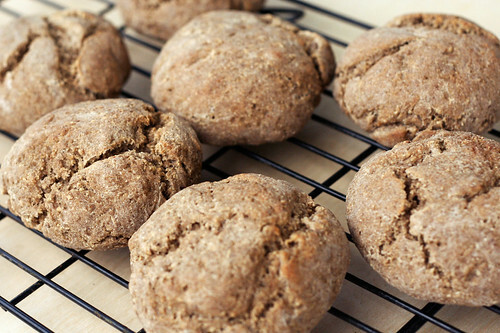 The same recipe with make two boules instead of the rolls, if you wish. 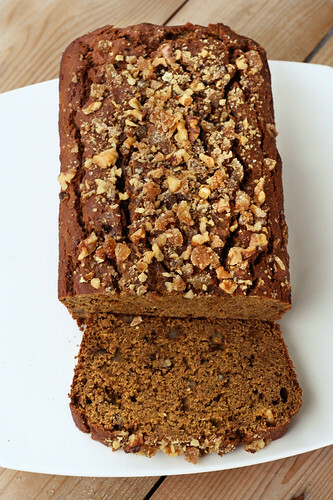 I thought I was in love with gluten-free girl’s previous bread recipe, but this one blows it out of the water. Try it! 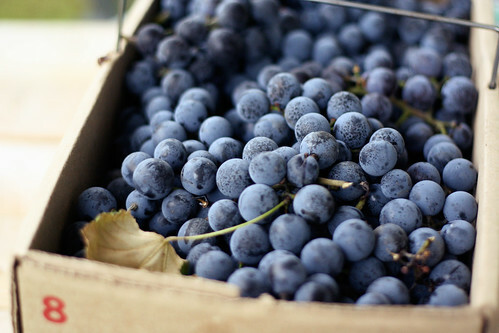 Oh and by the way, I have a very small amount of grapes left – not enough to really do anything major with – so I plan to soak them in vodka to make some tasty Concord grape infused vodka!! Come on, how could it not be good? Separate the skin from the pulp of each grape, by applying pressure to the grape with your thumb and index finger, shooting the pulp right out. It’s fun and very simple to do. Process the grape skins with the sugar in your food processor or blender until mostly smooth but still a tad bit chunky. If you want your jam super smooth, process longer. Transfer to a medium saucepan and add the juice of half a lemon. Bring to a boil over medium heat. Watch it carefully and stir often so it doesn’t stick or scorch. Once boiling, reduce the heat and simmer for approximately 25 minutes until it has reduced down and thickened. Meanwhile in a smaller saucepan cook the grape pulp (insides) and 1 tablespoon of sugar over a medium-high heat, bring to a boil and mash the pulp as it cooks to break the down. Once bowling reduce the heat and allow to simmer as long as your grape skins do. Once the grape skin mixture has thickened, remove the pulp from the heat and strain through a strainer or cheesecloth to remove the seeds. Add the juice that drained out to the grape skin mixture. Allow the jam to continue cooking another 10 minutes until thick. Taste for sweetness and add more sugar if it isn’t sweet enough for you. This was plenty sweet for me. The jam will continue to thicken as it cools. Trust me. It also thickens a bit more once in the refrigerator, so down cook it down too much. 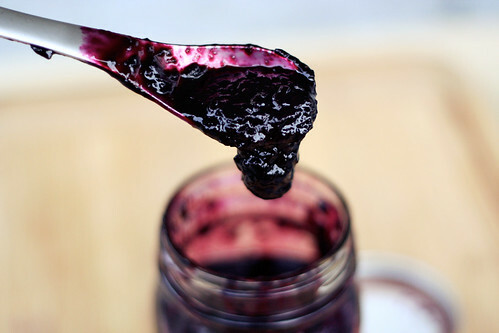 Allow the jam to cool before pouring it into a well cleaned and tightly sealing jar. This jam will keep in the refrigerator for approximately 1 month. NOTE: I have to apologize for the lack of process photos with this post, I had intentions of showing step by step photos of the entire process. However, the morning I was making this jam it was very dark and stormy. The lighting in my kitchen was horrible and with the yucky wind and rain, I wasn’t able to tote things out to the back patio as I usually do. If you have any questions regarding the process, please don’t hesitate to ask. It is pretty unbelievable to me just how much I love baking now. I actually used to despise it, I hated that seemingly every little measurement had to be perfect or you would pull it out of the oven to find it ruined, with no way to fix it. That is so different from cooking and it was way too much pressure for me. I love with cooking how no measurement has to be precise, there isn’t as much chemistry of ingredients involved so you can really play around. I got even more scared of baking when I found out I was gluten intolerant nearly 7 years ago. All the different flours, starches and gums made my head spin. I was always nervous that I would spend nearly $10 on a package of flour that I had never heard of, to just ruin the recipe and not even have a delicious treat after all that. I have finally loosened up a bit with baking and I am really starting to enjoy it. There are so many wonderful bloggers sharing their delicious gluten-free baked good recipes that I just started out by making those, making subtle substitutions here and there. As I have done more and more baking and experimenting, I have started to see what works and what doesn’t. What flours react well together and which ones don’t. I am still far from being an expert and I very rarely just dive right in and create my own recipe completely from scratch, it still intimidates me quite a bit. However, I have started to play a lot more this year and though there have been some pretty rough flops and fails along the way, I am still enjoying it. I decided I wanted to make a fun fall-inspired cookie this weekend. 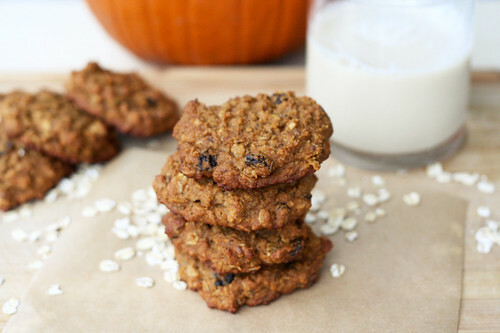 Beyond wanting something sweet but relatively healthy after my cleanse, oatmeal cookies have just sounded good for a while now. Plus, it was my birthday weekend and we had a really fun weekend of fall activities planned to celebrate my aging and the beautiful fall weather. 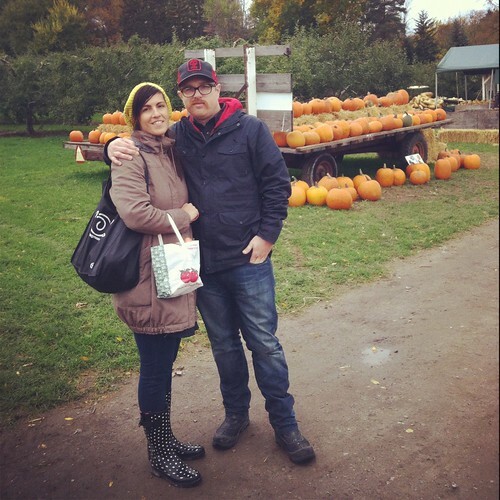 On Friday, we played hooky from work a few hours early to head up to Niagara-on-the-Lake for the afternoon. We walked around and checked out the little shops, I did some wine tasting, we had a couples massage at the Shaw spa and we had an incredible dinner at Epicurean. It was such a fun night. On Saturday morning, I made some delicious concord grape jam (I am gonna try to get a post together, though I didn’t take any process photos since it was a very dark and rainy morning), these cookies and then we spent the rest of the day working. Saturday night my parents took us out to Mangia Ristorante to celebrate my birthday. (By the way, Mangia has some of the most delicious Italian food I have had and almost all of their pasta dishes are available with gluten-free pasta). 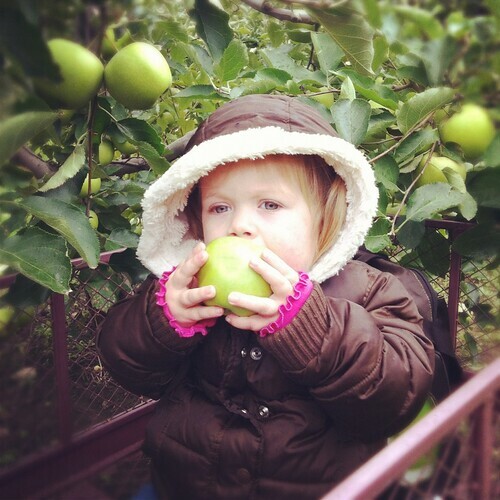 On Sunday we woke up and went apple-picking in the morning at Blackman Homestead Farm with my sister, Vicky, and my niece, Teagan. We had so much fun. Then we came home and I made a delicious fall dinner for us – a roast chicken from Sojourner Farm, with roast acorn squash wedges and baby fingerling potatoes over arugula – all from local farms. For dessert, we had some hot spiced apple cider that I had picked up at Blackman Homestead when we were apple picking and we served it with a couple of these cookies on the side. Such a perfect way to end a perfect fall weekend. Yesterday was my actual birthday and when we were eating dinner Mark had mentioned feeling bad that we were eating cookies that I made for dessert and that there hadn’t been any cake or candles all weekend and no birthday gifts to unwrap. I explained to him that my birthday included absolutely everything that I love and I couldn’t ask for anything more. That really is the truth. I am not one for cake and to me being around the people I love is truly gift enough. 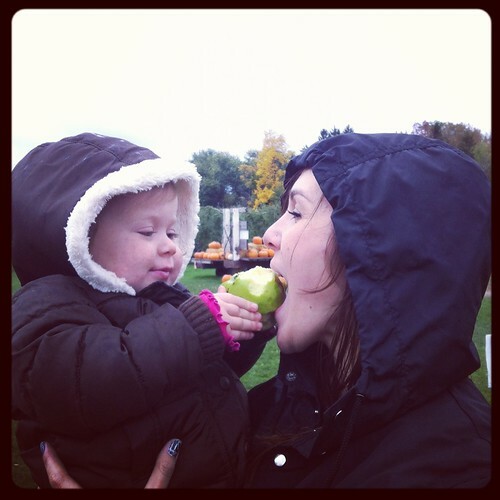 My sister, Vicky and Teagan sharing an apple. Beyond all the awesomeness of the events surrounding these cookies, they also made me super happy because I didn’t use a recipe – I just planned my own recipe with ingredients I knew (well, probably more like hoped) would work together. I ended up adding more oats than I had originally planned, because I knew with how the dough felt in my hands that it would be too thin. This is huge for me. A year ago I would have slopped the dough onto the baking pan and had a little fit when they came out flat and too soft. My guessing and instincts overall paid off and these cookies turned out wonderful. 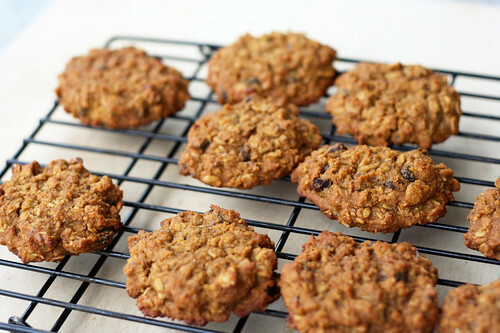 They are so moist and chewy, not dry at all the way some oatmeal cookies can be. They have the perfect mix of spices and I love that there is no butter or sugar in them. Just grape seed oil and honey. 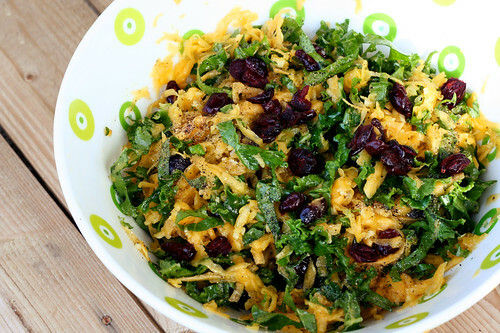 You could certainly replace the raisins with dried cranberries or even chocolate chips, you could add nuts and of course, you could simply use your favorite egg replacer to make them vegan. Hope everyone had a lovely weekend as well? Did you do anything fun? Preheat the oven to 375º F, line two baking sheets with parchment paper. In a large mixing bowl, whisk together the flour, baking soda, baking powder, cinnamon, nutmeg and salt. In a small bowl, whisk together the oil and honey until smooth and well blended. Mix in the egg, pumpkin and vanilla. Add the wet ingredients to the dry, stir to combine well, add in the oats, raisins and flaxseeds, stir until everything is well combined. Drop the batter by rounded tablespoons 2-inches apart on the baking sheets, flatten the dough gently with a fork. Bake the cookies for 18-20 minutes until they are moist and soft but appear to be dull on the outside and are starting to lightly brown. Rotate the baking sheets during baking for even heating (I rotated mine every 6 minutes). Remove the cookies from the baking sheet after a few minutes and allow to cool on a wire rack. Or eat one while they are still warm, you know you want to. Once the cookies are cool, store in an airtight container at room temperature. After being on a cleanse for two weeks, removing meat, fish, dairy, sugar, caffeine, alcohol, the usual gluten and processed foods, etc – I was looking forward to slowly adding some things back in this week. I love that after two weeks of removing those things from my diet, I no longer crave them, I don’t feel weighed down, exhausted, sluggish, bloated, etc. 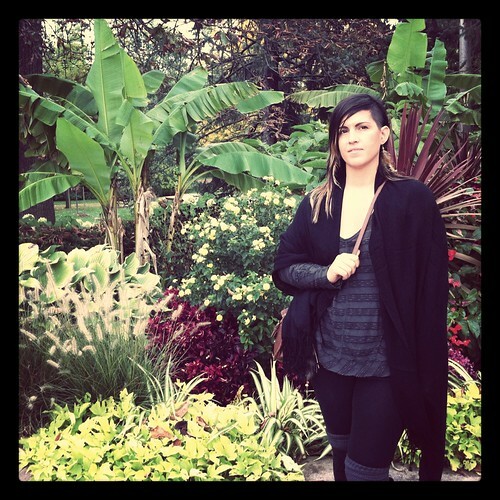 I feel like the change of seasons is the best time to wipe your slate clean and start fresh and new. Personally, in my life I like to subscribe to the idea of ‘all things in moderation’. That’s not to say I eat junk food, corn syrup laced sodas, processed foods, factory farmed meats and all that other yucky junk in moderation or at all, but there are some things that, though I know in excess can be bad for you (specifically for me – caffeine, alcohol, dairy, meat, sugar), I think in moderation are OK and in some ways good for you. I like cleansing because I can reset myself and my cravings and start over with the new season. I don’t see myself giving up dairy entirely anytime soon, or cocktails for that matter, so by doing a cleanse I can clean myself of all the junk in my body and any excessive cravings I may have for these things, especially after months of traveling and eating and drinking more than I would like to. Once I am off a cleanse, I don’t go all in again the very next day and make a drink to have with my massive cheese and meat platter, all finished off with a huge plate of cake – but instead I slowly start adding small amounts back into my diet. This is partially so my system isn’t shocked after two weeks of eating mostly vegetables, whole grains and legumes, but also so I don’t just jump back into old habits and cravings. This week I wanted to enjoy and add back in small amounts of locally farmed dairy and meat and some sweets – but only those made from alternative sweeteners such as honey, maple syrup or coconut sugar, no straight cane sugar just yet. This pizza was the first real treat after coming off the cleanse and I felt like it was a good way to go back in. I made the crust with flaxseed egg replacer (2 tablespoons of ground flax seeds with 6 tablespoons of warm water) and I got the goat cheese from First Light Farm & Creamery, a wonderful local farm with delicious goats milk products. In addition, the arugula, squash and onion were all from the farmers market and the rosemary was from my own garden. It doesn’t get much fresher and tastier than all that! 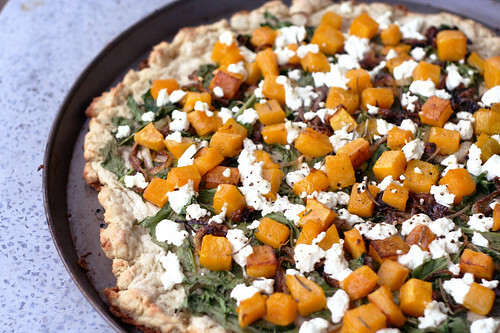 This pizza is loaded with delicious fall flavors, everything pairs together so well. 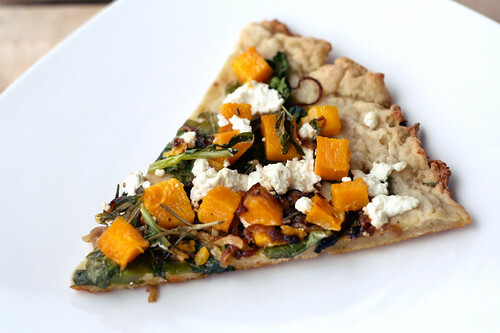 The arugula retains a nice subtle and spicy crunch, the squash is tender and so perfect with the rosemary and onions and the goat cheese finishes everything off with a super flavorful, rich and creamy tang! As mentioned in the recipe below, please feel free to use your own favorite pizza dough recipe (with or without gluten, it doesn’t matter) or even a good store-bought dough or crust. Since it was a busy weeknight, I used a package of Bob’s Red Mill gluten-free pizza dough mix. Although I have made some delicious gluten-free pizza doughs completely from scratch, I really love how easy and delicious the Bob’s Red Mill dough is for when you don’t have all that time. It is a pre-mixed blend of flours (without any additives or other wacky ingredients) and it comes with a package of yeast. You just add olive oil, eggs (or a flaxseed egg replacer) and warm water, that’s it. I like their crust because it is light, it has the perfect balance between chewy and crispy and it isn’t too thin or too thick. When I don’t have the time to make my own dough it really is a great alternative. I made this pizza earlier in the week and since then I have had a small amount more of organic dairy and some pasture-raised local meat from our farm. I am still feeling really, really great! I am really looking forward to having a glass or two of wine this weekend in celebration of my birthday and I am also looking forward to experimenting this weekend with making some healthy sweets made from sugar alternatives. 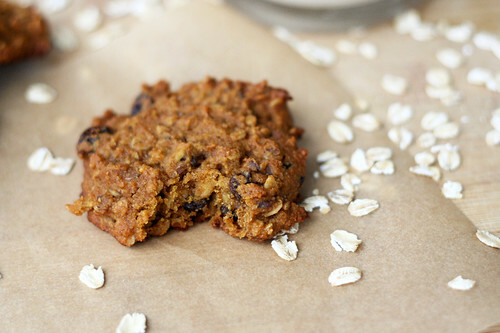 Look for a recipe tomorrow for my gluten-free pumpkin oatmeal raisin cookies made with honey instead of sugar and grapeseed oil instead of butter. Sunday morning we are going apple picking so keep an eye out for an updated version of my gluten-free apple crisp, I am going to try to make a version without butter or sugar! I can’t wait to play. Preheat oven to 425º. If you are making your own pizza dough, have it already mixed and rising. While your dough is rising, on a large rimmed baking sheet, toss the squash with 1 tablespoon of the olive oil, half of your salt, half of your freshly ground black pepper and half of your fresh rosemary. 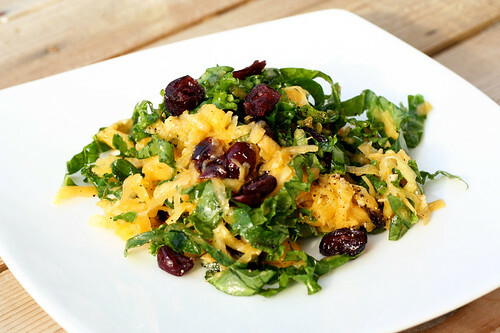 Cook the squash until slightly browned and tender, about 25 minutes, tossing occasionally to ensure even cooking. Set aside. While the squash is cooking, caramelize the onions in the other tablespoon of olive oil with a dash of salt in a large skillet over a medium-high heat. Stir often and cook 10-12 minutes until perfectly browned and caramelized. Set aside. Once all of your toppings are ready, pre-bake your dough without the toppings (mine took approximately 10 minutes), then remove from the oven and top with squash, onion, arugula, crumbled goat cheese and the remaining rosemary, salt and pepper. Bake until the crust is crispy, lightly browned and the cheese is melted, about 15-18 minutes. Obviously whatever pizza dough recipe or ready-made crust you choose to make this with will be fine, just adjust your cooking temperature and times accordingly (if necessary).